Whit Stillman’s novel, based on the film, Love & Friendship is out (since May 3rd). So if for some reason you cannot make it to the theater, then be sure to check out this highly acclaimed novel. As a bonus it has the original text in the back. Princeton Garden Theatre, Princeton Public Library, and Labyrinth Books Princeton are delighted to welcome writer/director Whit Stillman for a Q&A following a screening of his latest film LOVE & FRIENDSHIP. 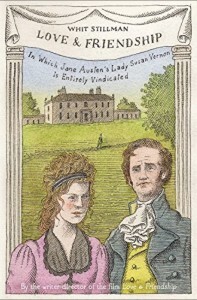 Based on the unfinished Jane Austen novella “Lady Susan,” Whit Stillman has adapted the story for screen and written a novelization of the film also titled “Love & Friendship” which has been published by Little, Brown and Company. Following a screening of the film, Stillman will be taking questions from the audience and signing copies of the book. The book will be available for purchase at the theater before the screening. Book signing will take place in the lobby after the Q&A. Thank you to Hachette Books for making this possible! Unserious Austen by Adam Thirlwell at The New York Review of Books (May 27, 2016). Whit Stillman’s Love & Friendship novel can be purchased on amazon. It’s a quieter, English-country-house-version of Les Liaisons Dangereuses—where a ruthless woman is humiliated. But in Stillman’s rendering, something has happened to its finale. True, Lady Susan is now married to Sir James Martin and Frederica is married to Reginald De Courcy. But in the original, it is Reginald who broke off the relationship with Lady Susan, when he discovered the extent of her duplicity. In Love & Friendship, it is Lady Susan’s decision. It is not humiliation, but quiet control. At one point, her confidante, Mrs. Johnson, observes to Lady Susan that in fact to marry Sir James herself would not be an irrational project, given her precarious financial position as a widow: “I would rather be married to my own husband than dependent on the hospitality of others.” Stillman’s Lady Susan will not be Blanche DuBois. Her stratagems can be appreciated not as immoralities but as moving pirouettes of social survival. ‘Love & Friendship’ Novel Out Now! Originally Whit Stillman’s Love & Friendship novel was set for release on the 17th of May in the USA, but you can get it now!